This entry was posted on December 17, 2014 by LemonCitrusTree. Christmas is just around the corner! This is one of our favorite times of the year. To celebrate we will be running sales until Christmas, so be sure to check our Facebook for our newest coupon. Click here for a printer friendly version of this project. The holiday season is all about family and there is no better way to celebrate family than spending quality time with your kids. So here is a fun project that you can do with the little ones while making your house smell wonderful with the freshness of oranges. The ornaments also serve a practical purpose if you have cats. 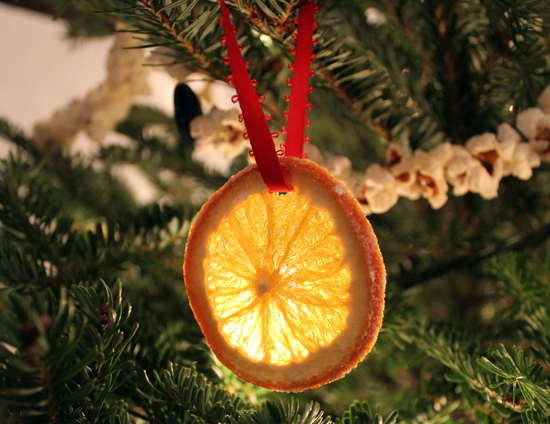 Cats hate the smell of citrus, so when you use these ornaments they will avoid your Christmas tree! Now this recipe is not limited to just oranges, you can try this with any citrus that you have but oranges tend to have a longer lasting smell and the smell mixes well with the cinnamon used in the recipe, so good that you might be tempted to eat the ornaments! Here are some popular varieties used to make ornaments. 2. Slice the oranges crosswise into 1/4 inch thick slices, discard the ends. If your oranges have seeds, remove them and discard. Lay the slices on paper towel. Use paper towels to blot excess juice on the slices. 4. Place the orange slices directly on the oven rack for best results. You may use a cookie sheet but if you do you need to spray the orange slices very lightly with cooking spray or they will stick. Allow slices to bake in the oven for an hour. 5. Turn down the temperature in the oven to 215. If you used a cookie sheet, you may need to flip the orange slices for even drying. Once turned, return to oven to dry for an additional two hours. Once two hours has passed check the slices for dryness. If the slices are not dry allow for more time, be sure to check the slices often. Once they are dry, allow to cool completely. 6. Take the Hobby Knife and cut a 1/3 inch slit into each orange just under the rind. 7. Cut a piece of Ribbon at least six inches long with your scissors and fish the ribbon through the slit you just made on the orange slice. Then tie a bow towards the two ends of the ribbon, so you have a hoop that you can use to secure the ornament on the tree. 6. Now you can get the kids involved by decorating the orange slices. You can glue the Glitter as suggested in this recipe or decorate any other way you like! It's best to use a very thin coat of white Elmer's glue. Be very careful to use the glue very sparingly, you don't want to rehydrate the orange slice! Silver or Gold Glitter lightly applied to the fruit of the orange gives a lovely sparkling glow when close to lights on the Christmas Tree. Be sure to allow any glue to dry completely. 7. Decorate Your Christmas Tree! Happy Holidays & Merry Christmas from LemonCitrusTree!